Tom and Jerry have had long and fruitful lives as cartoon characters. The titular cat and mouse began in a series of animated cartoons created by William Hanna and Joseph Barbera for MGM in 1940 and have evolved several times over the last 70+ years. It’s a familiar recipe for cartoons – take one lovable scoundrel, introduce a second scoundrel to the same environment, and see which scoundrel wins. Last I checked, it’s a dead heat and neither cat nor mouse has gained the upper hand. I believe I’ve seen most, if not all of the Tom and Jerry cartoons at one time or another. Even in my 40s, I still watch cartoons with my kids and the classics like Tom and Jerry, Bugs Bunny, Road Runner, and Scooby-Doo seem to beat most current cartoons hands down. But I’m starting to grow tired of Warner Brother’s current attempts to milk the franchise on DVD for more money with single-DVD collections of the Tom and Jerry shorts. Every few months, there’s a new release. 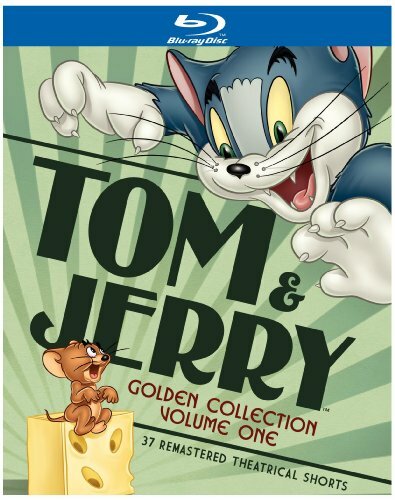 Now I have to say I’m eagerly anticipating the Tom & Jerry Golden Collection: Volume One when it arrives on Blu-ray in October 2011. Apparently the new collection features the first 37 shorts, restored from the best 35mm originals they could find, in beautiful 1080p HD with Dolby 5.1 sound. And the rumor is that the new collection will show the original cartoons un-edited and un-censored. That collection is currently available for pre-order at Amazon today and I’ve already got my order in. 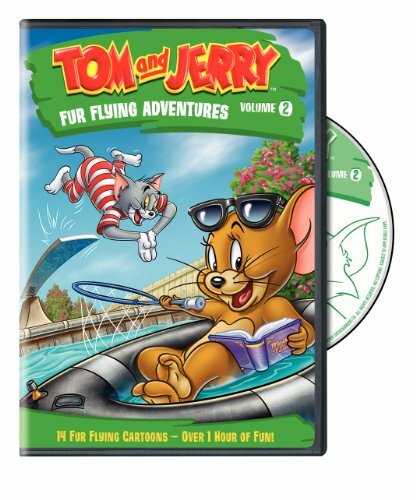 However, Tom and Jerry: Fur Flying Adventures, Volume 2 seems to be a hodgepodge collection of 14 shorts from three very different eras of Tom and Jerry production and the quality of the transfers leaves quite a lot to be desired. My personal favorites are the original Hanna-Barbera shorts from the 1940s & 50s and those from when Chuck Jones was working on them in the mid-1960s, not the shorts from the later series Tom and Jerry Tales. Several of the transfers of the shorts really didn’t come across well at all, with obvious scratches and a jittery picture. It was especially noticeable in some of the shorts from the ’50s and ’60s. The newer Tom and Jerry Tales shorts had a nice, clean transfer with little extra movement beyond what the creators wanted. You do get to see favorites from the original shorts, including Spike and Tyke, Butch, Lightning, and Topsy. Of the classics included, I think “Tom and Jerry in the Hollywood Bowl,” “Saturday Evening Puss,” and “The Haunted Mouse” are my favorites. Unfortunately you also get to see ill-conceived shorts from Tom and Jerry Tales like “Monster Con” which pairs Tom up with Van Helsing as they go monster hunting at a monster convention. Like most of the newer Tom and Jerry cartoons, these seem to be poor, shallow imitations of the earlier era of shorts. Beyond the Tom and Jerry cartoons themselves, there are no extras except for a few trailers for other Warner Brothers-produced shows such as The Looney Tunes Show (which fails except for the brilliant 3D Road Runner/Coyote cartoons) and a collection of Snoopy’s adventures in Happiness Is… Peanuts: Snoopy’s Adventures. If you’re a fan of the classic Tom and Jerry cartoons, I’d seriously skip Tom and Jerry: Fur Flying Adventures, Volume 2 and save your money for the upcoming Tom & Jerry Golden Collection: Volume One to be released in October 2011.